Thanks for all the great feedback on my new layout, I have made the post text font bolder, and hopefully that´s made it easier for you to read. Today I present to you the first installment in my new segment Fun!. If you are interested in joining in on the fun, you are more than welcome, just grab the code below, paste it in one of your sidebars, leave a comment about it here, and off you go. I´d love it if you´d tell me if you are joining me, the more the merrier! 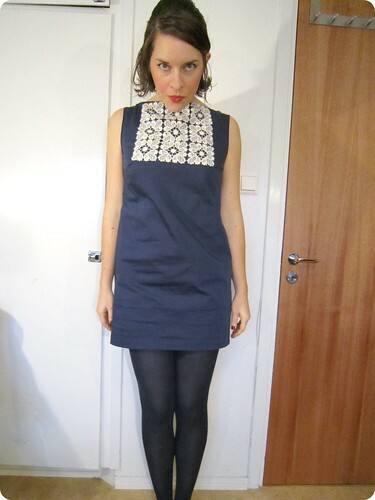 This dress was made on a whim last autumn, but I haven´t actually begun to wear it much until now. The inspiration for this dress is a combination of two things. I really wanted to make a navy dress with lace inspired by this incredible dress that Zoe made, and I thrifted the lace for this dress (it´s really a table cloth) ages ago. My second reason for making this was a longing for clothing with no waist definition. Now, don´t get me wrong, I love high- waistedness, thoroughly documented here, here, here and here, but after a summer of wearing mostly waist-clinching garments, I longed for something that was a bit more relaxed. Well, here you have it, my review of this pattern, it is yet another BurdaStyle pattern, the only obvious change I made was to skip the sleeves. Did it look like the photo/drawing on the pattern envelope once you were done sewing with it? Apart from the fact that I omitted the sleeves, yes. Were the instructions easy to follow? I didn´t follow the instructions much (although I probably should have), but what I used was quite clear. What did you particularly like or dislike about the pattern? I really like the simplicity of the pattern. A really classic style, that can be used for lots of different styles. Fabric Used: I used a heavy cotton sateen with quite an amount of stretch, not entirely suitable for this style. I wouldn´t recommend this fabric for this type of dress – try either something really stiff and heavy for a boxy effect, or something with a better drape for a softer shape. Pattern alterations or any design changes you made: I omitted the sleeves, as I didn´t want it for my version, I made an FBA on the bust darts, and because my fabric is stretchy, I omitted the back zipper. Would you sew it again? Would you recommend it to others? I might make it again, perhaps with the sleeves, and I would recommend it to others. Conclusion: A really simplistic design, and a nice shape for a shift dress. A good pattern! How mod! How fabulous. I love the clever usage of the lace. It looks perfect on the dress. Fun! I love the lace application! Love the navy and lace. And the length. Super fun! Question: is this a new length for you? I only just discovered higher hemlines for myself and while I like them I am a bit wary of wearing them to work. Do you? Fun, fun, fun! You rock the 60’s mod look, Solvi! I’m definitely in for sewing fun things this year! Woot! A Gorgeous dress!Only wish i had the legs for something like that!!! Would love to join in the fun too! I love days like this and in THIS I means days I find adorable blogs like yours. I simple love your dress. I can’t wait to see all the things you make and read your past posts. Oh no! An inspiration- circle! That can´t be good. Or can it…?